Is there any archaeological evidence to support the Exodus of the Bible? This week, Jews all over the world are celebrating the Passover, the annual feast remembering God’s deliverance of the Hebrew people from the bonds of slavery in ancient Egypt. Is there a genuine historical basis for these events surrounding the Passover? After the release of Ridley Scott’s movie, Exodus: Gods and Kings, and a new documentary film by Timothy Mahoney, Patterns of Evidence, which seeks to re-examine the archaeological evidence, there is a renewed interest in understanding how the exodus of Moses and the Israelites from underneath the yoke of slavery in Egypt might have happened. This fascinating and highly recommended essay by Jewish scholar Joshua Berman explores the issue of the historicity of the Exodus. Berman takes a position similar to mine, in that once we dismiss the notion of a “massive” event involving 2 to 3 million people, that really should be numbered more in terms of several tens of thousands (see Numbers 3:43 for one additional piece of evidence that Berman cites), a lot of the intellectual hurdles to accepting the biblical story tend to fall off. On the others side, over the years there have been a number of attempts made by some documentary filmmakers exploring these questions, often suggesting some rather controversial theories. How does one go about evaluating these different claims? In a 2014 lecture, Egyptologist James K. Hoffmeier at Trinity Internation University and Wheaton College geologist Stephen Moshier consider some of the more controversial theories and review them in the light of Scripture and the available evidence. As a follow-up to this previous extensive Veracity posting on this topic, you might find Hoffmeier and Moshier as providing a more modest perspective that nevertheless still honors the biblical record. The bottom line: while there are a plethora of different proposals for resolving the questions surrounding the Exodus, there is enough evidence to rule out some of the more extravagant claims. Patterns of Evidence: One Night Showing Tonight! On Monday, January 19, 2015, selected movie theatres across the country will be showing a special documentary film, Patterns of Evidence. The story is about a filmmaker, Timothy Mahoney, who had a crisis of faith when he learned from the consensus of critically minded scholars that the Exodus, the famous story of Moses leading the people out of Egypt and the parting of the Red Sea,… NEVER HAPPENED. Well, at least, that is the conclusion that is drawn from many archaeologists of the ancient Bible periods. True, the study of archaeology has yet to provide demonstrative evidence confirming the Biblical account of the Exodus. Therefore, many come to the conclusion that the Exodus was simply a “made up” part of the Bible. In other words, the story in the Bible is just as fictional as Ridley Scott’s version of it in Exodus: Gods and Kings, introduced with extensive background discussion to the archaeological issues involved here earlier on Veracity. But is there another way to approach this issue and arrive at a different conclusion? In Mahoney’s documentary film, he looks at the possibility that the search for the Exodus has focused on the wrong time and place. Having not seen the film myself, I can not myself offer a review, but you may want to look at the following reviews from Answers in Genesis and the Gospel Coalition. To find a film showing for this one night in your area according to zip code, look here. (In Williamsburg, Virginia, it is at 7pm at the High Street Movie Tavern). A 6:30 pm discussion led by Fox News commentator Gretchen Carlson and featuring author Anne Graham Lotz, Eric Metaxas, Father Jonathan Morris, and Dennis Prager precedes the film. If you attend the film, I would like hear your thoughts about it, as I am not sure myself that Mahoney’s case is without difficulties. Take a skeptical friend. It is sure to be controversial and generate plenty of conversation. Does the filmmaker make a convincing case? Check out the Veracity review of the film by viewing the comments section below, given by Veracity’s own John Paine. Thanks, John! So, what type of archaeological evidence would a mass migration of escaping Jewish slaves leave behind to be discovered some three thousand plus years later? The story is indeed a familiar one to students of the Bible. A Hebrew man grows up among the ancient Egyptian royalty, only to be called by God to lead his people out of slavery under the defiant eye of Pharaoh and across the Red Sea. But what will Ridley Scott’s epic deliver? One of the main concerns of potential movie goers will be the historical accuracy of the film. A recent poll indicates that if the story is mostly consistent with the biblical account, over 70 percent of Americans surveyed will see the film, whereas if it is inaccurate, close to under 70 percent will forgo it. The problem is figuring out what is meant by “historical accuracy.” If you had a shovel over there in Egypt, what would you discover? Back when I was in college, I worked as an usher at a drama theatre. One night, I caught this guy trying to sneak in after the show started. “Sir, may I see your ticket please?” My demeanor startled the guy, but then he flashed me his official guest badge. On the badge read “PETER O’TOOLE”. The 1962 film, Lawrence of Arabia, is one of my all-time favorite movies. But I have always wanted to know who the real T. E. Lawrence was. In the following article, I discovered that Lawrence was an illegitimate child. His father ran off with the governess. His father and his mother (the governess) were never able to legally marry as his father never secured a divorce from his legal wife. Lawrence’s mother eventually, torn by her guilt, found relief when she came to know Jesus Christ as her Lord and Savior. She was determined that her children would have a Christian education. Lawrence’s mother and a brother later went to China as missionaries. T.E. Lawrence never really embraced his mother’s faith, but he did gain a love for the Holy Land from what he was taught from the Bible. 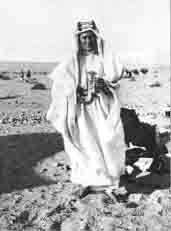 It was this fascination with the ancient Middle East that led him to pursue archaeological work across the Palestinian landscape and beyond, eventually giving him the opportunity to serve in British intelligence to aid the Arabs to rise up against the Ottoman Turks nearly a hundred years ago. Read Stephen E. Tabachnick’s full article on BiblicalArchaeology.org to learn more. We walked up from the subway having no idea what we were going to see. The cashier asked if we wanted tickets to the Mesopotamia exhibit (featuring artifacts on loan from the British Museum), so we were treated to a couple of hours of a really, really good history lesson. While we were buying our tickets, the cashier at the counter position next to us (his name was Rex) made some impious statement to a visiting couple about how glad he was that his parents hadn’t imposed any religious beliefs on him. (Rex apparently hasn’t thought much about atheism as a religion.) I mention Rex’s sound bite because it followed me around the museum for quite a while; a sad reminder of how people can bristle right past the evidence.